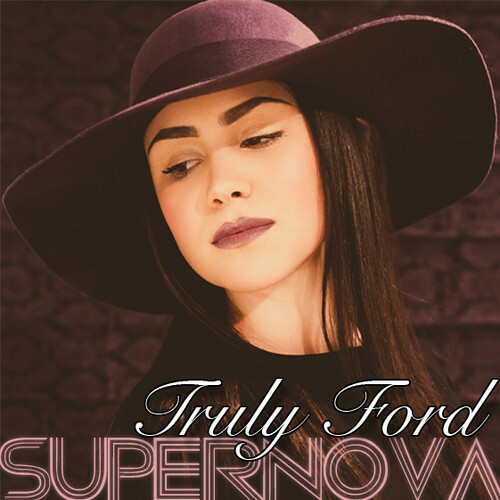 “Live It Up” is the debut single from 19 year old UK artist, Truly Ford and is lifted from Truly’s debut EP, ‘SuperNova’, which is set for release in a couple of weeks (artwork above). After just one listen, it should come as no surprise to read that Truly recently showcased for Jay Z’s Roc Nation and Def Jam/ Island. “Live It Up” boasts a soulfulness and maturity way beyond her 19 years. Making the comparison to Florence and The Machine is somewhat unavoidable with the power, timbre, enunciation, mood, and emotion of Truly’s vocals strongly resembling those of Ms. Welch. Even the shouts of “Live It Up, Live It Up” throughout the chorus are reminiscent of Flo’s “Shake It Out, Shake It Out”. Florence aside, “Live It Up” is a very, very impressive debut. A 16th note piano melody drives the song, which is then offset by a funky bass line and Truly’s stunning, melodic vocals which simply dance atop of the music. Check out the beautiful melancholy-tinged vocal melody that occurs during the pre-chorus around 1:00 – 1:25, boasting a Brandon Flowers-esque quality. The distorted guitar that joins in for the final two choruses is a tad cheesy but not enough to detract from the song’s excellence overall. Once again, like the music of Florence and The Machine, “Live It Up” has a strong cathartic quality from which the listener can’t, not even for a second, doubt Truly’s sincerity. The EP ‘SuperNova’ featuring “Live It Up” will be released 18 November, 2013.